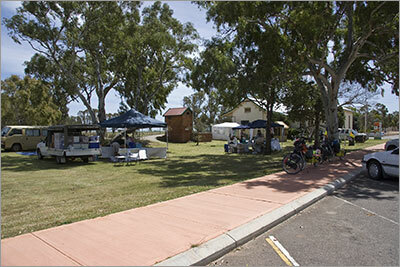 We left Sunset Beach Caravan Park at 9am with the wind already blowing reasonably strongly and it was quickly obvious that we would not make the 110km to Mingenew today. The wind kept the temperature low for most of the day and we wonder if we need the winter riding clothes that we sent home when we were in Brisbane. At one stage Mark was wearing his reflective vest on top of his long sleeved riding shirt to cut the wind. 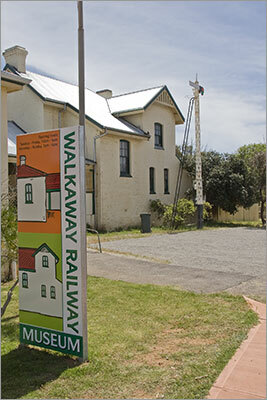 We arrived in Walkaway at 11.30 just as the markets, that are held outside the railway museum every month, were packing up. Luckily we were still able to buy a morning tea of scones with jam and cream and cups of tea. This cost us $5 in total – the best value morning tea we have had on this trip! After morning tea we rode for about 30 minutes before stopping for lunch. Shortly after lunch we climbed about 100 metres in a couple of kilometres. It was quite steep – see elevation profile. We did get some good downhill runs though. 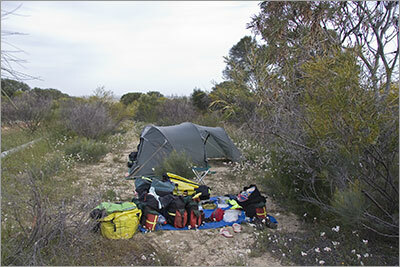 We started to look for a campsite around 3.30 and found one up a narrow track about 50km from Mingenew. We pitched the tent amongst a show of everlasting daisies. The only downside of our spot was the flies and mozzies which forced us to use our fly nets in combination with our hats. This was our companion for lunch. He started by rubbing his neck on the gate and then progressed to this water trough - something was obviously bothering him. A wind farm can be seen in the background. 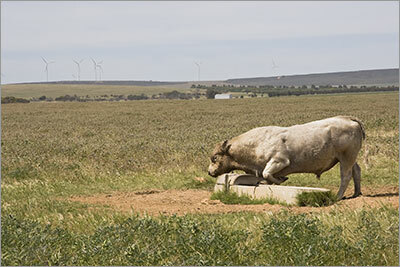 The radio news reported that another 18 turbines will be added to this farm, we estimated at least 50 already in place, so it is not our imagination that it is windy here.